A mild but intense assault on your senses! 14 select flavors combined together to create a “punch” juice that is familiar yet completely unique to any other fruit juice you have ever come across. We have been told that it tastes like trading card stick bubble gum but the more common response it just lots of fruit. 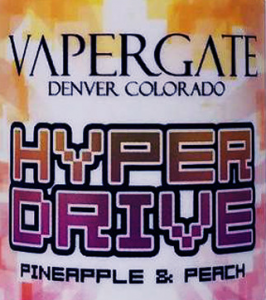 Going back to the roots of Vapergate, Hyper Drive a very welcome fruit flavor in the world of desert liquids. Hyper Drive is a refreshing combination of tropical pineapple and luscious peach, paired together with a very subtle cream. You get fruit on the inhale and a marbled swirl of citrus tart and cream on the exhale. Smurfette is very similar to Smurf’s raspberriness but embraces a uniqueness all its own. Imagine vaping Smurf, chewing some grape gum, and drinking a Sprite all at the same time. Like Smurf, it has a wonderfully subtle all day appeal to it and also produces light fluffy clouds of vapor well beyond its 20/80 rating. Crystal Smurf is the natural progression of our original Smurf, Vapergate’s #1 seller. 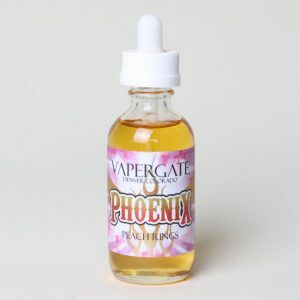 A full flavored blue raspberry is the main profile with this juice adorned with a more subtle bouquet of additional fruits and berries beneath. Besides the lack of additional coloring of Crystal Smurf, we have refined it’s vape experience. The end product tastes cleaner, vapes cleaner, and is kinder to your coils and cotton. Crystal Smurf tastes like the original but better. Strawberry Vanilla goodness. Mature pallets will find other fruit hiding in the background while being accented with a hint of cream round out this special juice. People say it tastes like a dark strawberry frosting or icing. Horrie Cheesecake was developed for and with the help if Mr Leo Lee He is best known for his rendering of the infamous Tiger wire. The base profile is a New York style cheesecake with a sweet and sour lemon and strawberry glaze. Not your typical cheesecake, the crust notes are very very subtle as is the traditional “cheesecake” heaviness. this vape is very fruity, slightly creamy, and a touch sour. THIS JUICE IS THE FIRE. Phoenix’s profile is on point with the traditional delicious gummy candy peach rings! Spot on peach with a creamy compliment that implies the marshmallow and a sprinkle of the crunchy sugar crystal coating.